Beloved brothers and sisters in the Lord! Today the Orthodox Church – the entire Orthodox world, and especially the Russian Church – honors with great solemnity the memory of one of the greatest ascetic strugglers among the ranks of saints, our Venerable and God-Bearing Father, Sergius of Radonezh the Wonderworker. 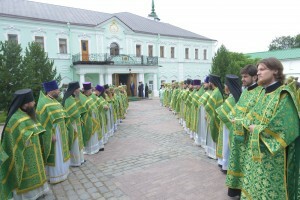 Again and again we thank our Sweetest Lord and Savior, Jesus Christ, that by His mercy we have been granted to gather today under the shelter of the holy churches of the ancient monastery of St. Sergius, a monastery sanctified by the footsteps of the Most Holy Queen of Heaven; and here, at the tomb of this great man of prayer and protector of the Russian land, to open our hearts and pray for the salvation of ourselves, of our relatives, and for the salvation of our Church. St. Sergius lived in the fourteenth century, in those difficult times when our Fatherland and ancestors bore the terrible yoke of foreign enslavement to the Tartars, experiencing great sorrows. The cries and supplications of the people reached the Lord Who, being greatly merciful, raised up St. Sergius for the deliverance of our land. He was a leader for the Russian people just as the Prophet Moses was for the Israelites. By his moral influence and prayer, the venerable one instilled strength and faith in the people, rousing them for the struggle for national liberation from the Tartar oppressors, thereby writing a bright page in our history. Therefore, our people so revere St. Sergius and come in a never-ending stream to his holy monastery to venerate his relics. But the venerable one was not only a protector of, and intercessor for, our land. 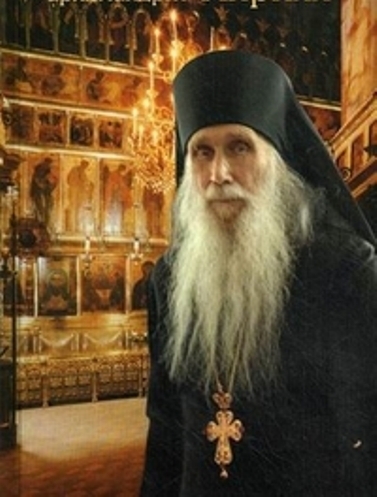 He is also known to Orthodox people as a kind, deeply loving, humble Elder, ready to give his soul for his neighbor. He was distinguished by his simplicity of manner and accessibility; by his equable and affectionate treatment of all; and by his holiness and temperance in all things. These qualities attracted people to him even during his earthly life. Despite the fact that St. Sergius settled in a remote and impenetrable forest, the light of his good deeds shone therefrom, spreading to all the ends of our unbounded Motherland. People came to him with various sorrows and requests; his deeply loving heart was especially receptive to the grief of the people. From him they sought comfort and consolation in their woes, asking for his counsel and prayers; and he, like a kind and gentle father, did not leave anyone without consolation who had recourse to him with faith. When the venerable one reposed, our people mourned his departure, but firmly believed that St. Sergius had not died, but only moved from earth to heaven, where he will not forget his fellow countrymen. 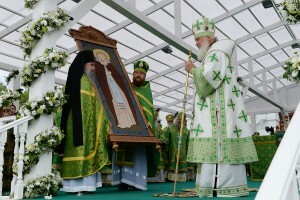 Following his repose, the God-pleaser did indeed pour out streams of miracles upon the Russian land from the prayerful invocation of his name and from his incorrupt sacred relics. Six centuries have already passed since St. Sergius lived and struggled, but he has remained all this time a protector of the Russian land. He is rightly considered the Guardian Angel of our Fatherland. Indeed, in times of extreme danger to our Motherland, when all hope in our own strength is lost, St. Sergius rises to our aid – and then our land is saved by his prayerful intercession and those, through his supplication, of the Most Holy Theotokos. Dear brothers and sisters, today we celebrate the uncovering of the relics of St. Sergius. 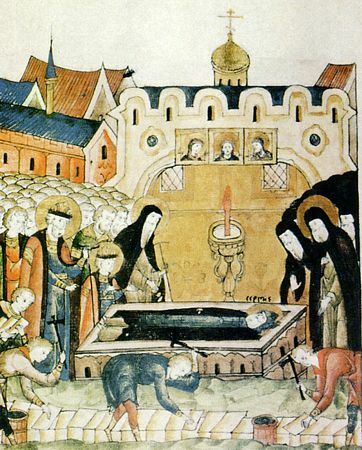 The venerable one reposed on September 25, 1391; thirty years later his relics were found to be completely incorrupt. Not only was his body incorrupt, but even his clothes were preserved unharmed by corruption. Through the incorrupt sacred relics of His saint, the Lord bore witness to the world that his life was holy and righteous before Him. Not only was his soul purified and enlightened, becoming an abode of the Holy Spirit, which is now in heavenly blessedness, but his very body was made a vessel of the grace of the Holy Spirit, having been purified through bodily struggles and labors from all sinful inclinations, desires, lusts, and passions; his body therefore did not fall under the general law of corruption, but was preserved incorrupt. By this incorruption, the Lord teaches us in the very best way that the lot of the righteous will not be the same as that of the ungodly. Everything that the righteous one bears in this word for the Lord’s sake and for the salvation of his soul – sorrows, deprivations, struggles, illnesses – all this will gain him a reward in the age to come, when the Lord will come to give to everyone according to their deeds. Then the righteous, in the words of Holy Scripture, shall shine forth as the sun (cf. Matthew 13:43). Dear brothers and sisters, what St. Sergius was for his contemporaries, so he remains for us today. All of you who have gathered here out of love for the venerable one have left your homes and families and, regardless of difficulties and deprivations, have come here to honor the memory of our heavenly intercessor and supplicant; we believe that he will look down today from the heavenly heights and bless you all with his heavenly blessing, granting you the fulfillment of all that you ask. 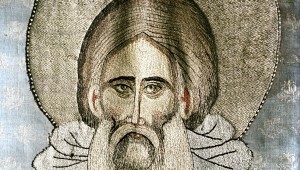 Our entire Orthodox family has gathered today; therefore, my dear ones, let us pray to him now from our whole souls, opening our hearts to him and asking him to protect us on all the paths of our life so that, being guarded by his prayers and supported by his heavenly protection, we might live righteously and piously in this age and attain the future eternal life. Amen.